The HSM Securio B34s Strip Cut office shredder helps keep your large office productive and focused on what really matters in your business. 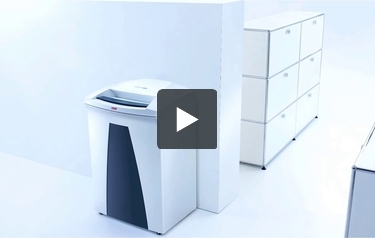 The HSM Securio B34s shredder offers peace of mind and ease of use when it comes to securely disposing of your personal and business information. Capable of shredding paper, credit cards, CDs and paper clips into level 2 secure pieces, the HSM Securio line of office shredders guarantees that you can be secure and work with confidence. Check out the HSM Securio B34s strip cut shredder from MyBinding.com today and save. Document Shredder HSM Securio B34. High performance model for deskside use. HSM Made in Germany. Multi-function control button - easy handling and navigation of the operating modes. Economic energy management EMCS. Shreds CDs, credit and store cards. Reusable waste collection bag. Separate CD waste collection container. Automatic reverse in the event of a paper jam. Automatic oiler maintains high cutting performance and reduces wear and tear. Specially hardened solid steel cutting rollers are virtually wear-free for a precise cut. Document Shredder HSM Securio B34. High performance model for deskside use. HSM - Great Products, Great People. www.hsm.eu. Have you and your colleagues decided that you need a new paper shredder? If so, the HSM Securio B34s might be the perfect machine for your needs. Keep reading to discover its strengths and weaknesses, so you can decide if this device is right for your workplace. The B34s is a terrific choice if you need a device with a great shredding capacity. The machine can shred up to 25 sheets at a time so you can get rid of your paper in a flash. The paper can be up to 12" wide. This shredder has a durable cutting mechanism that's able to destroy credit cards, CD's, and document fasteners such as paper clips. Since the device is able to shred some non-paper items, your information will be less likely to wind up in the wrong hands. The B34s is perfect for shared workspaces because it has a continuous-duty motor. The machine has a waste bin that can hold about 24 gallons of shreds so it can be used throughout the day. This machine is very well-made and has really durable parts such as the steel cutting rollers. There's even a closed gear transmission that's designed to stay in good shape while keeping the interior of the machine clean. The B34s could possibly help you save money on energy costs because it has an Energy Management and Control System that will help you use less electricity. Also, the machine will shut down after a period of non-use. These features are great for both your bottom line and the environment. And last but not least, this shredder is covered by a 2-year warranty. The B34s is a strip-cut shredder. While this isn't a bad thing in and of itself, it does mean that the device doesn't offer as much security as a cross-cut model. But don't worry, this is still a good machine for the everyday shredding of computer printouts, invoices, etc. This shredder is enormous. Its approximate dimensions are 17" (depth) x 21" (width) x 33" (height) so you'll need a lot of room for it. This could be a problem if your workspace is on the small side. The HSM Securio B34s is a terrific office shredder and it's one that's probably suitable for most workplaces. This machine's shredding capacity is first-rate and you'll be able to get rid of a lot of documents pretty quickly. The ability to shred some non-paper items is always a plus and will help you protect your information. Also, this shredder is very durable, has the ability to shut off automatically, and can help you reduce your energy consumption. However, keep in mind that this device is a strip-cut model so it doesn't offer the same amount of protection as a cross-cut unit. Also, the machine is huge, so it requires a lot of room. (Be ready to move some furniture and electronics around, if necessary.) If the B34s sounds like the right shredder for you, get it today.